Great Presentations make Great Things happen. Since 2009, we the DELFER GROUP have been your experts when it comes to presentations. We specialise in designing and creating Prezi presentations as a “Prezi agency” for our clients. On our website you will learn why a Prezi presentation will make you more successful when presenting your content to your audience in an engaging way. We will gladly develop and design your next Prezi presentation. Our clients value us for offering the complete package or individual components they need, whether it’s concept, story, graphics, image editing or implementation in Prezi. This will save you the hassle and time of training, and your presentation will be more engaging and memorable. Are you looking at purchasing Prezi licences? We are happy to find the right licence package for you. With us you will receive special rewards when activating Prezi Team licences. Get a quick introduction to Prezi with our popular online training courses. 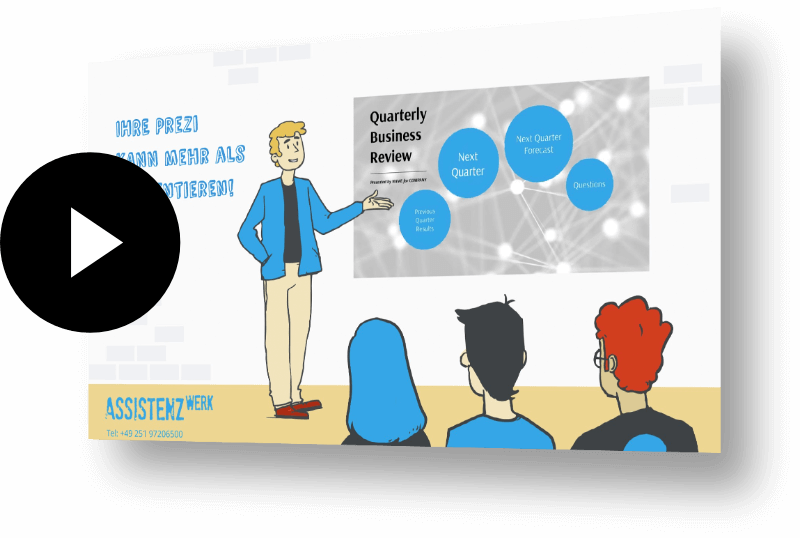 Our experienced trainers show you all the features and put you and your team in the position to create your own presentations in Prezi within a very short time. Prezi is a presentation software that lets you present your content in an engaging and memorable way. A 3D-like workspace offers the possibility to structure your content and respond dynamically to questions from the audience during the presentation. Our clients use Prezi in many areas, including: sales, HR, management, marketing and communication, events, and meetings. Since 2009, the DELFER GROUP has specialised in Prezi and offers many services around the zooming presentation software. On an almost infinitely large, virtual presentation workspace, you move through the content with camera shots. Prezi Classic has existed since 2009 and has since revolutionised the world of presentations. The idea for Prezi came from the architect and artist Adam Somlai-Fischer, who founded Prezi in Budapest. Since spring 2017, Prezi is also offering Prezi Next to create presentations. The main differences to Prezi Classic are: a software that works without Flash, clever structures, and new levels not previously visible to the public. With Prezi Analytics you will not only find out who is looking at your presentation at what time and for how long, but also much more. For more information on Prezi and why more and more businesses are using this amazing software please click here. In South Africa, we experts from the DELFER GROUP are your point of contact when it comes to Prezi presentations. Since 2009 we have been working with the presentation software Prezi, and we have created hundreds of presentations for our clients. Our company was founded in Germany and has been operating in South Africa since 2018. Success Made in Germany: on time and to the point. We are proud to lead the Top 6 Prezi Platinum Certified Experts worldwide. Since 2009 we have been working with Prezi. We have published manuals for Prezi Next and Prezi Classic, hosted workshops and training, and created Prezi presentations for clients. In addition, we are constantly educating ourselves and exchanging ideas with colleagues from Prezi and the Experts team. 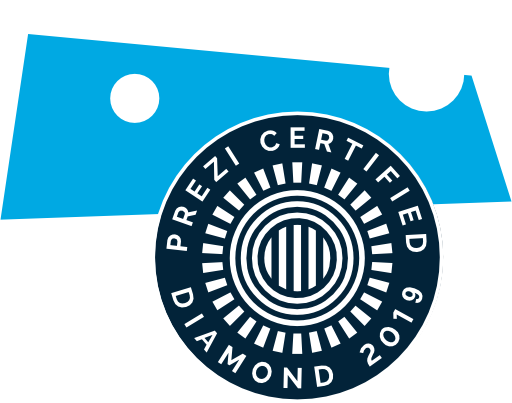 The Prezi Certified seal gives you the certainty of dealing with real Prezi professionals. Your Prezi can do more than just present. Why not create a movie from your Prezi or embed it as an interactive presentation on your website? We will show you even more uses and will be happy to assist you during the implementation process. In addition to creating a Prezi from start to finish, we also offer to create interactive information pages, digital annual reports, online magazines, dynamic maps and informative dashboards for our customers. Take a look of what is possible! 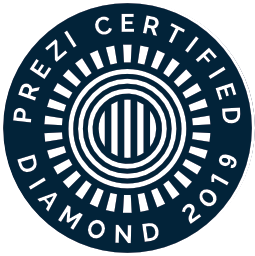 We are leading the top 7 of Prezi Diamond Experts worldwide – the highest certification possible!